This device looks sick. That’s what I can say. This looks like the ultimate dream on the go. Imagine this: you working on your iMac at home on very-very important project. The phone rings and you realize that you have to go… I mean you don’t have a choice you have to leave the house. 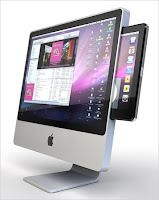 Not a problem, just grab the tablet from your iMac and finish your work on the go. Sounds great! And that is how it looks like. Like this blog? More cool blogs just like this here! Like the Website? Check Out Our Sponsors! Is Facebook Lite a Twitter killer?